Before Cabo San Lucas was known as the tourist town it is today, the beaches were inhabited by a nomadic Guaycura Amerindian group called Pericu. The Pericú were hunters and gatherers; the shores around Cabo made it easy to live off of shellfish, small game and wild plants. There is also evidence that they were skilled weavers and potters as well. The Cabo coastline remained untouched by European explorers until 1542, when Juan Rodriguez Cabrillo, a Spaniard, made the first contact with the Pericu people while exploring the waters of the Pacific for the Spanish monarchy. The Spanish forces remained because of the threat of English pirates in the area. The harbor at Cabo San Lucas continued to be used by pirates until the mid-18th Century as a hiding place after attacks on Manila Galleons (you can see a ship similar to these in the harbor). The pirates also enjoyed the many coves and inlets, perfect places for stashing loot. After pirating became a thing of the past, the port was mostly ignored because of the lack of fresh water available there. More activity came to the harbor at the end of the 19th Century. Baja-californianos began exporting bark from the local palo blanco tree, to be processed and used in leather tanning. This made Cabo San Lucas a main shipping port. With the increase of nautical traffic, the Faro Viejo lighthouse was built in 1890 by port authorities at the nearby Cabo Falso. The abundance of tuna in Cabo was discovered in the early 20th Century, and in 1917 an American tuna cannery was moved from San Diego to Cabo San Lucas to take advantage of this new resource. This brought a new population that continued to grow even as the native population dwindled. By the 1930s, a small fishing village had developed to supply the cannery. The harbor was then occupied by about 400 people, all of whom were involved in the canning industry. This remained the driving force of the local economy until 1941, when a hurricane destroyed a large part of the factory. 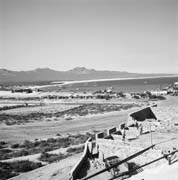 The damage was devastating and Cabo San Lucas was all but abandoned during World War II, when Japanese submarines patrolled the coast. After the war, leisure travel became a popular activity and Cabo was rediscovered as a game-fish paradise. Word of mouth brought a sport-fishing craze to the cape in the 1950s and 1960s and Cabo became a hot spot for catching prize-winning marlin and other swordfish. During this time, the small village grew in size to about 1500 residents (not including the many seasonal fishermen that were brought in by plane or boat to fish the cape). The slow but steady pace of growth changed in 1973 when the Transpeninsular Highway was completed. This new link by land between the United States and Cabo San Lucas brought even more traffic to the area. The city soon became a popular destination for people traveling by car and recreational vehicle, in addition to those who already came by boat or plane. Nowadays, the small fishing village has become a bustling tourist attraction. 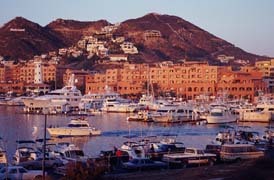 Cabo San Lucas has increased its numbers and now boasts a population of almost 25,000. The majority of people who call this place home make their living from the tourist industry and most of them are recent arrivals seeking work. 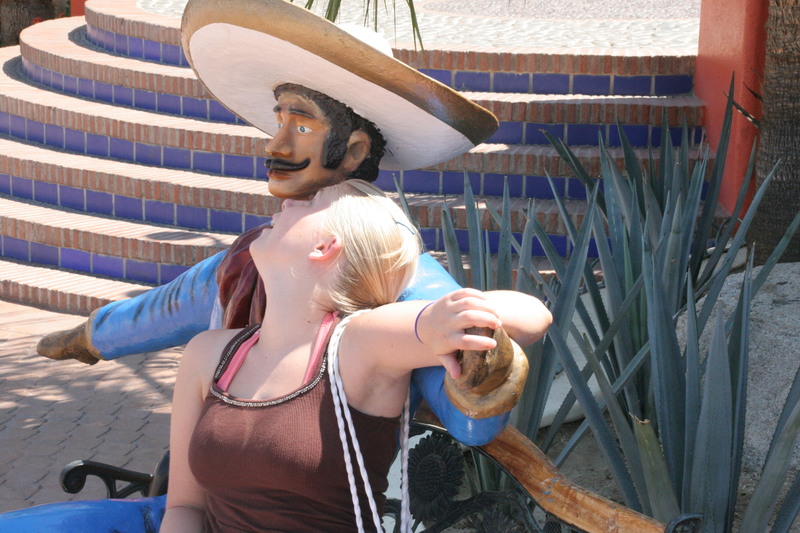 Many small shops and boutiques line the streets with souvenirs and handcrafted Cabo clothing. Tour guides are ready to show off the spectacular coastline (and the sights under the water too). Affordable boating adventures and tours await those ready to take to the waves and are a sign that Cabo is no longer an exclusive yacht club just for the upper class sports fishermen. Great fishing is not the only activity that brings people to the southernmost tip of the Baja peninsula. First class golfing attracts sportsmen of a different kind, while the beaches bring legions of sunbathers each year. Scuba diving is also a popular draw for visitors; the beautiful waters are great for watching exotic, colorful marine life. Despite deep roots in the past, so richly displayed at the Museo de las Californias, Cabo San Lucas has a distinctly modern feel. It is far enough away from home to be a great getaway, without feeling too foreign. It’s good, but it just doesn’t taste right. I’m tempted to go into my “fear and loathing” mode and begin to reflect tales of drunkenness and debauchery unparalleled in the relatively sane universes of my faithful followers. It would be satisfying to sit at my keyboard and reflect on the dozens of times we’ve hung upside down at the Giggling Marlin, crashed our Sea Doo’s at 50 miles an hour and walked away without a scratch, or summoned the Mariachis to our room at 2:00AM to serenade our sleeping wives. Ah yes, that would be tempting indeed; Perhaps another day when I have the time. Today I must pack. The past few trips I have made with my darling, and utterly sane, wife. It is a welcome romantic getaway and much easier on my wallet and liver. 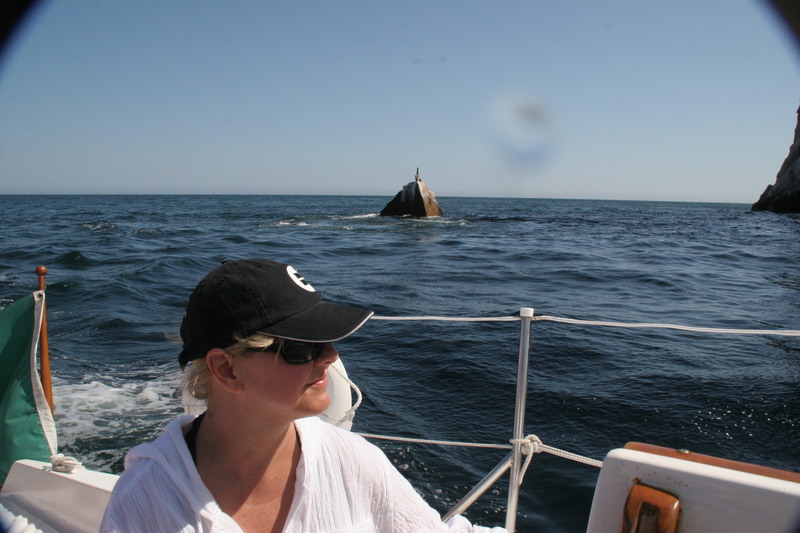 This en ds up being a Disneyland storybook vacation filled with whale watching, great cuisine, snorkeling at Chileno, diving at Cabo Pulmo, yachting on a former America’s Cup yacht, and making love on the beach. It is so wholesome I often anticipate Doris Day or Frankie and Annette approaching us with fresh baked muffins, butter, and honey. We are trying to eat healthy, will hit the Gym and take long walks about the golf course early in the morning. Brian Flynn had to give up his bar, but we will probably search the downtown in vain just one more time to see if he has gravitated back to the Cabo Wabo orbit. Other than that our late nights are now relegated to a rare cigar and a cocktail at Pitahayas before retiring by 11:00. I have been coming to Cabo since my parents took me on a Mexican cruise in 1968. I realize that that is most likely before most of you were born. Things have changed a bit in that time. 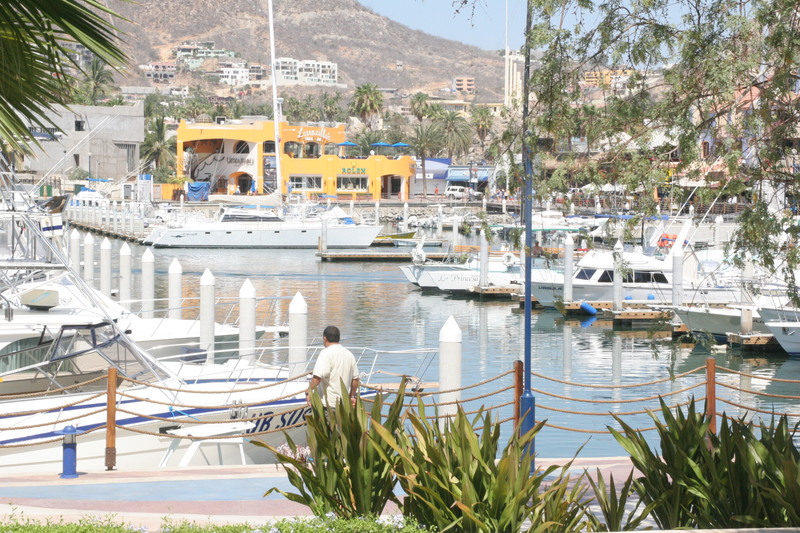 When I first saw Cabo there were only three hotels, the harbor was roughed out but no boats were anchored near it. There were no shops on it. 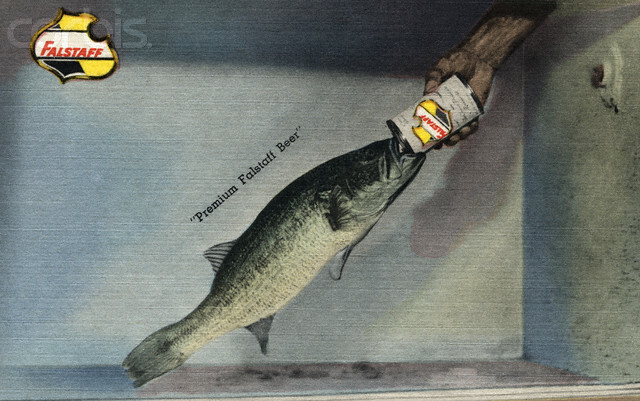 Bud Parr was the reigning landlord and you could rent a panga for $10 per hour and catch enough fish your first day to eat for a week. The Office was a thatched shack on the beach, by itself, and was a common occurrence to have a couple of tequilas with the locals and play volleyball (they cheated) before ambling down the beach to hear the Hispanic version of Hotel California butchered by the locals at El Dolphin as the bartender peddled his little $25 bindles of 10% cocaine to supplement the meager salary and tips left by the gringo ex-pats. The first iteration of the Giggling Marlin miraculously burned to the ground as a direct result of the lack of proper payment to local “authorities” and employment of a sufficient number of local staff. The “Trailer Park” restaurant was in the center of town, and there were not 15 other restaurants sporting the same name littering the “corridor turistico.” Actually, back then it was just a road. The point of all this is that I will be there this whole week. Through the magic of technology and incredible foresight rendered me by my mentor Jay Berkowitz and USF, I am able to schedule this blog to mysteriously leap upon your screen even in my absence. I hoist a tequila in your honor, pray for your continued health and success, and attempt to enjoy the Cabo, and the man that is present now. It is supposed to hit 25’ tonight in Redwood City. I will be sleeping with the door open and only a sheet covering me at Hacienda Del Mar.